Which conditions can be treated by acupuncture? 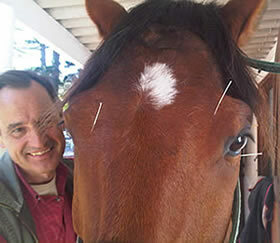 Dr Jan Still, a fully qualified veterinary surgeon and a member of the International Veterinary Acupuncture Society (IVAS), offers animal acupuncture as an alternative treatment to traditional veterinary medicine for animals. He holds post-graduate diplomas in acupuncture and anaesthesiology and has a special professional interest in acupuncture, sport & musculoskeletal medicine, pain-relief and neurological conditions. Dr Still works in the Johannesburg and Pretoria area for appointments for horses. Small animals are treated in Dr Still's rooms in Lonehill - a northern suburb of Johannesburg.